After escaping persecution in Europe, these Jewish scholars found hatred in its American form — and a deep bond with historically black colleges and universities. The Nazi Party sought to destroy all forms of Jewish life, and Jewish academics were among the first victims of the party’s fatal endeavors. In 1933, just months after coming to power, the Third Reich passed a law that barred non-Aryans from holding civil and academic positions, thereby dismissing around 1,200 Jews who held academic posts in German universities. Over the course of that year and throughout World War II, many academics — established and burgeoning alike — fled Germany. Most went to France, but some made the trek across the Atlantic Ocean for the United States. Approximately 60 of these Jewish academics took refuge in the American South. There, they found a startling reminder that the systemic persecution that they experienced was not isolated to Germany under the Third Reich. They also found a home in the South’s historically black universities and colleges. ullstein bild/ullstein bild via Getty ImagesLocals in Leissling, Germany performing mocking folk custom known as “the expulsion of Jews,” 1936. While theoretical physicist Albert Einstein often serves as the “poster boy” for Jewish academics who quickly found a fulfilling intellectual life in the United States, his story was more of an exception than the rule. Indeed, throughout World War II, the U.S. lacked an official refugee policy, and instead relied on the 1924 Immigration Act. This act placed a quota system on admitted immigrants, which it based on the immigrant’s national origin. The act favored Western and Northern Europeans — and Germany had the second highest cap — but because so many German Jews sought entry to the U.S., many waited (and sometimes died waiting) on the list for years. If a Jewish academic were to be admitted entry into the U.S., they often had to contend with the fact that academic institutions — particularly Ivy League schools — by and large did not want them there. While Princeton University welcomed Albert Einstein to the Institute for Advanced Study in 1933, many other academics did not have the same name recognition and thus were subjected to the prejudices and pretensions of the university. While students often held demonstrations against administrative displays of Anti-Semitism, the message seemed clear: if you were a Jewish intellectual seeking sanctuary in the U.S., you may not have found it in the academy — at least among the more prominent academic institutions. Jack Delano/PhotoQuest/Getty ImagesPhoto taken at the bus station, showing the Jim Crow signs of racial segregation, Durham, North Carolina, May 1940. That hardly meant that Jewish academics in the U.S. would simply stop seeking work in academia, however. For some, it meant that they would set their sights south — particularly among historically black colleges and universities (HBCUs). These individuals — who taught at HBCUs in Mississippi, Virginia, North Carolina, Washington, D.C., and Alabama — were in for a rude awakening. In the 1930s, the American South was in an economic tail spin, which only had the effect of increasing racial tensions. Indeed, poor whites looked to African-Americans as a primary cause of their suffering — even though, as the Library of Congress notes, the Great Depression hit African-Americans the hardest of all. As such, Jim Crow laws passed around this time took on the institutions that could offer African-Americans upward mobility and thus help ensure increased, substantive equality among races over time. For instance, in 1930, Mississippi passed a law that segregated healthcare facilities and required racial segregation in schools. This atmosphere — protracted economic malaise creating conditions for systematic persecution — was not unfamiliar to Jewish academics attempting to make a home out of the American South, yet it horrified them all the same. Indeed, in 1942 Birmingham, Al. police fined Rasmussen $28 for sitting in a café with a black acquaintance. Other Jewish academics learned from these run-ins with the law and responded accordingly — even in the privacy of their own home. “This was a time when if blacks and whites were meeting at someone’s home, you had to pull down the shades,” author Rosellen Brown said. Public DomainErnst Borinski and his students in Tougaloo University’s Social Science Lab. 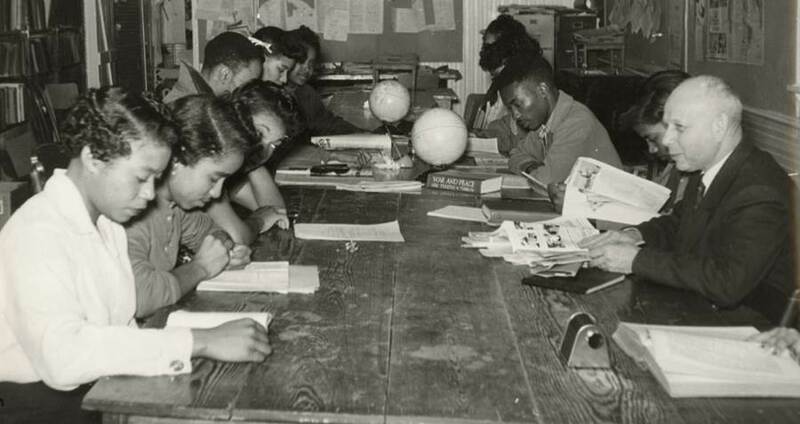 In spite or perhaps because of Jim Crow, and in spite or perhaps because of the Nazi Party, Jewish academics and students at HBCUs found in one another a camaraderie whose fruits would last a lifetime. Students likewise found role models — and perhaps unlikely bonds — in their marginalized peers. Still, this intellectual fraternity presented questions to some students. Cunningen was one of German-Jewish sociologist Ernst Borinski’s students at Mississippi’s Tougaloo College. Borinski would teach at the school for 36 years until his 1983 death and be buried on the campus. One of Borinski’s students, Joyce Ladner, went on to become the first female president of Howard University, a HBCU in Washington, D.C. Years after Borinski’s death, Ladner returned to Tougaloo, and to the grave of the man whom she saw as truly transformative. Men and women like Borinski would not just leave an indelible mark on their students lives; in many ways, students would embed their teachers — icons of hope and resilience in the face of oppression — within their own experience. Next, learn about what happened when a white man named John Griffin toured the segregated South disguised as a black man.